These pictures are from the various competitions entered by the adult and junior members of the Bradford Tomiki Aikido club. The 2019 BAA Junior Open (North) were on Saturday 9th March at the Richard Dunn Sports Centre, with over 100 Junior Aikidoka taking part from clubs in Bradford, Leeds and Yon Ju Hachi (Boston Spa, Garforth, Harrogate and Ferrybridge). The 12th International Aikido Festival was held in Akita, Japan, the birthplace of Tomiki Sensei and Oba Sensei. The host for this international festival was the Japan Aikido Association. Club members were part of the British Aikido Association (BAA) GB Team that competed at this international festival. For them, this was the first time they had been to an international competition in Japan. Although they were unable to replicate the success they achieved at the wsaf-junior-youth-cadet-and-senior-world-championships, the BAA Squad won gold in the Women’s Individual Randori and the Men’s Team Randori. The first ever Worldwide Sport Aikido Federation (WSAF) Junior, Youth, Cadet and Senior World championships were held in August 2017, at the University of East London – SportsDock. Over 200 Aikidoka from Great Britain, Australia, Brazil, Ireland, Japan, Netherlands, Russian Federation, Spain, Switzerland and the USA competed in the first ever WSAF World championship. The 2017 BAA Junior Open (North) were on Saturday 11th March at the Richard Dunn Sports Centre, with over 100 Junior Aikidoka taking part from clubs in Bradford, Leeds, Manchester, Sheffield and Yon Ju Hachi (Boston Spa Aikido Club). The 3rd Junior/Youth European Tournament was held over the weekend of 29th October at the English Institute of Sport (EIS), Sheffield, with over 150 junior and youth Aikidoka from clubs in Bradford, Dunbin (Ireland), Leeds, Renshinkan (Manchester), Sheffield, Tanseikan (London), Yon Ju Hachi (Boston Spa Aikido Club) and Russia. The 2016 BAA Junior National Championship was on Saturday 25th June at the Richard Dunn Sports Centre, with junior Aikidoka taking fom clubs in Bradford, Leeds, Yon Ju Hachi (Boston Spa Aikido Club), Manchester and Dublin. The BAA Junior National Championship was on Saturday 27th June at the Richard Dunn Sports Centre, with Junior Aikidoka taking part from clubs in Bradford, Leeds, Harrogate, Huddersfield, Yon Ju Hachi (Boston Spa Aikido Club), Wharfdale and Manchester. On Saturday 14th March, juniors from the Bradford Tomiki Aikido Club took part in the BAA Junior Open Championships (North) that was held at Richard Dunn Sports Centre in Bradford. 2014 BAA Junior Open (South) was again held in the High Wycome Judo. 100 Junior Aikidoka from Bradford, Leeds, Wharfdale, Huddersfield, Eastleigh, Tanseikan, Greenhills Tomiki Aikdo (Dublin), Yon Ju Hachi Aikido (Boston Spa) and Shogun Aikido Kai (Herne Bay) taook part. In October, the 2nd Junior and Youth Tomiki Aikido European Championship was held in St Petersburg, Russia, with over 170 juniors competing. Juniors from a number of clubs in Yorkshire took part in this championship, competing as the BAA Yorkshire Team. The BAA Yorkshire Team did exceptionally well, making some of the finals and were a credit to their coaches and clubs. The BAA Junior Nationals were on Saturday 21st June, at the Richard Dunn Sports Centre, with over 150 Junior Aikidoka taking part from clubs in Leeds, Manchester, Sheffield, Wharfdale, and Dublin. Well done to our Juniors who were awesome throughout the day. On Saturday 22nd March, juniors from the Bradford Tomiki Aikido Club took part in the BAA Junior Open Championships (North) that was held at Richard Dunn Sports Centre in Bradford. On Saturday 23rd November, juniors from the Bradford Tomiki Aikido Club took part in the 2013 BAA Junior Open Championships (South) held at the High Wycombe Judo Centre, competing against teams from Eastleigh, Tanseikan (London & Bromley), Essex Aikido Club, Leeds, Huddersfield and Wharfdale. Friday 20th September until Monday 23rd September saw the 10th International Tournament being held in Kawasaki City, Japan. Phil and Seb were members of the 2013 BAA Team that competed at this tournament, with Phil winning silver as part of the 5 man BAA Randori team. Phil and Seb also reached the finals of the Open Kata event. On Sunday 28th July at the 2013 BAA Summer school, Seb successfully passed his grading was was awarded his Dan grade. Seb shakes hands with the Grading Panel on his award of his Dan grade. The 2013 BAA Junior National Championship was held on Saturday 29th June at the Richard Dunn Sports Centre in Bradford. Juniors from the Bradford Tomiki Aikido Club took part competing against teams from Leeds, Harrogate, Huddersfield, Sheffield, Wetherby and Wharfdale. On Sunday 23rd June, Phil, Seb, Amardeep, Molly and Rajdeep competed in the 2013 BAA Club Championship was held at the Dartford Judo Centre. On Saturday 16th March, juniors from the Bradford Tomiki Aikido Club took part in the BAA Junior Open Championships (North) held at Richard Dunn Sports Centre in Bradford, competing against teams from Leeds, Harrogate, Huddersfield, Sheffield, Wetherby and Wharfdale. Bradford Tomiki Aikido Club at the 2013 Junior Championship (North). On Saturday 24th November, juniors from the Bradford Tomiki Aikido Club took part in the BAA Junior Open Championships (South) held in High Wycombe, competing against teams from Eastleigh, Tanseikan (London & Bromley), Winchester College, Essex Aikido Club, Leeds, Huddersfield and Wharfdale. August 18th and 19th saw the 2012 ETAN European Championships being held in Moscow, Russia. Phil and 10 other members from the BAA went to Moscow to take part in this championship. In total the BAA team won 23 medals with Phil winning bronze as part of the 5 man randori team and bronze as part of a ninidori with Dan and Sarah. The 2012 BAA Summer School was again held at the English Institute of Sport (EIS) in Sheffield. The seniors all successfully passed their grading. On Saturday 30th June, juniors from the Bradford Aikido Tomiki Club took part in the Junior National Championships held at the Richard Dunn Sports Centre, Bradford, competing against teams from Leeds, Wakefield, Harrogate, Huddersfield, Ellesmore Port (Epic Aikido Club) and Herne Bay (Shogun Aikido Kai). Phil and Seb took part in the British National Championships held at the EIS in Sheffiled, where they won Gold in the Randori-no-kata (Embu) event. On Sunday 26th February David, Dave, Amarbir and Kally successfully passed their grading; David was awarded 5th Kyu (yellow belt), Dave was awarded 4th Kyu (orange belt), Amarbir was awarded 3rd Kyu (green belt) and Kally was awarded 1st Dan (black belt). Aikido grading held on 26th Feb 2012 and the Sheffield EIS. 2011 was a packed year for both juniors and seniors of the Bradford Tomiki Aikido Club. Juniors took part in all 3 junior championships (National, Northern and Southern) and as always demonstrated a high standard of Aikido – a fitting testament to the commitment and dedication from both juniors and their parents. Some of the juniors also spent a weekend taking part in the International Junior Aikido Training Camp that was held at the Sportscentre Bloso – Netepark in Herentals, Belgium. Seniors took part in the 9th International Aikido Tournament held at Brunel University as members of the BAA Team. They competed against teams from Australia, Belgium, Brazil, France, Japan, Netherlands, Russia, Spain and the USA. Both Lee and Phil were members of the BAA first team. On Saturday 26th November, uniors from the Bradford Aikido Tomiki Club took part in the Junior Open Championships (South) held in High Wycombe, competing against teams from Eastleigh, Ittaikan (Brighton), Tanseikan (London & Bromley), Thanet Judokwai (Margate), Winchester College, Leeds, Huddersfield and Wharfdale. Phil, Matt, Lee, Garry, Kally, Seb, Bradley and Amardeep competed as members of the BAA GB team at the 9th International Aikido Tournament that was held at University Brunel Sports Complex, University Brunel. Approxiamtely 300 Aikidoka from Great Britain, Spain, France, Russia, Switzerland, Belgium, Brazil, Australia, USA and Japan took part in this international tournament. Garrett was a referee for a number of events over the three days. Lee was a member of the GB BAA team that won Gold in the Team Randoria event. Juniors from the Bradford Aikido Tomiki Club took part in the 2011 Open Championship (North) that was again held at the Richard Dunns Sports Centre in Bradford, competing against teams from Leeds, Wakefield, Wetherby, Wharfdale Aikido Club (Ilkley), Sei-Ki-Kai Aikido Club (Bingley), Harrogate, and Huddersfield. Although the Bradford juniors won medals in the various different age categories, their points total wasn’t enough to win the overall team team title which again went to the very strong team from Leeds. A number of Bradford Juniors took part in an International Junior Aikido Training Camp that was held at the Sportscentre Bloso – Netepark in Herentals, Belgium. This was a two day event, with a mixture of Aikido training, a tug-of-war, hopping on one leg (which had something to do with Aikido), a strange game with bin liners and numerous meal outs in Belgium. Juniors from the club took part in the 2011 National Championship that was again held at the Richard Dunns Sports Centre in Bradford, competing against teams from Leeds, Wakefield, Wetherby, Wharfdale Aikido Club (Ilkley), Sei-Ki-Kai Aikido Club (Bingley), Harrogate, and Huddersfield. The juniors won both the the Under 10 and Under 12 age categories, and won medals in both the Under 8 and the Under 16 age categories, they weren’t able to regain the overall team team title which again went to the very strong team from Leeds. Phil, Lee, Matt and Seb took part in the Senior National Championship was held at the Dartford Judo Centre. Once again there was success for Bradford Tomiki Aikido Club at this championship. Phil and Matt won Silver in Basic Kata event. Phil and Matt also won Silver in Open Kata event. Lee and Charlette (Leeds Aikido Club) won Bronze in the Open Kata event. Phil, Paul Carr (Leeds Aikido Club) and Dan Ramsden (York) won Gold in the Ninindori event. Matt, Seb and Charlette (Leeds Aikido Club) came 4th in the Ninindori event. Justin, Garry, Kally and Amardeep competed in the Senior Kyu Grade Championship in Sheffield. Amardeep came 2nd in the Randori-no-Kata event. Garry came 3rd in the Ninindori event and also come 4th in the Men’s Tanto event. Justin got through to the second round of the Randori-no-Kata event. Kally and Garry got through to the second round of the Open Kata event. 2010 was another year action packed year for members of the club. The juniors come second at both the Northern and National Championships, but rounded the year off by retaining their Southern Area Championship title. Phil, Lee and Seb won gold at the Adult Kyu Grade Championship. Lee, Seb and Justin competed at the ETAN European Championship in the Czech Republic. 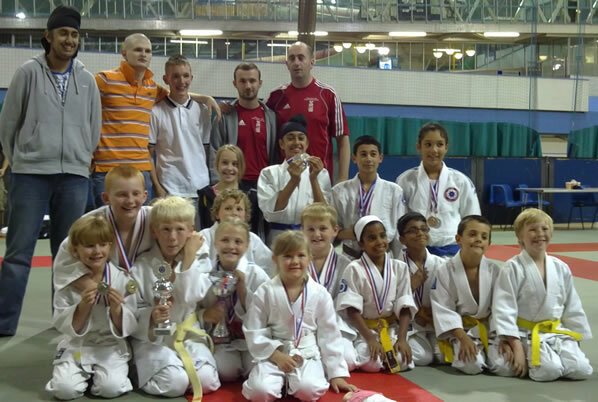 Juniors took part in the 2010 Junior Championship (South) held at the Wycome Judo Centre in High Wycombe. For the 3rd year running, the junior won the overall team trophy and are again the Southern Area Champions. Juniors from the club took part in the 2010 National Championship held at Richard Dunns Sports Centre in Bradford, competing against teams from Leeds, Wakefield, Wetherby, Sei-Ki-Kai Aikido Club (Bingley), Wharfdale Aikido Club (Ilkley) and Kingfisher (Redditch). The 2010 Adult Club Championship was held in Dartford. Phil, Lee and Seb from Bradford Tomiki Aikido club took part in this championship. Seb and Lee and Charlette (Leeds Aikido Club) won gold in the Embu category. Lee, Mark (Leeds Aikido Club) and Jermaine (Leeds Aikido Club) won gold in the team Randori category. Lee, Phill and Jermaine (Leeds Aikido Club) won gold in the mixed Randori event. Juniors from the club took part in the 2010 Northern Area Championship held at Richard Dunns Sports Centre in Bradford, competing against teams from Leeds, Wakefield, Wetherby, Sei-Ki-Kai Aikido Club (Bingley) and Wharfdale Aikido Club (Ilkley). Unfortunately, the team wasn’t able to retain the team title they won last year, coming second to the very strong team from Leeds. Click to view the honour roll from 2000 to 2009.